Brief selection of projects completed for the Master's in Human-Computer Interaction program at the Georgia Institute of Technology in Atlanta, GA.
A project completed as part of a core class for my MS-HCI program. We designed for college students - 18 to 25 yr - who are studying abroad. Our final solution was a kiosk designed to solve the communication problems we discovered from user research. This project served as an excellent introduction to the design process - it's part of a required course our first semester of the program. We started by choosing a user group. After identifying our users, we proceeded to conduct semi-structured interviews and used affinity mapping to identify their primary problems. We also explored existing solutions that these students used to solve their problems. With an understanding of our users, their problems, and what already exists, we moved into a divergent brainstorming phase for solutions. We settled on three, presented them to the rest of the class (see posters), and elicited their feedback to identify which option to explore more. 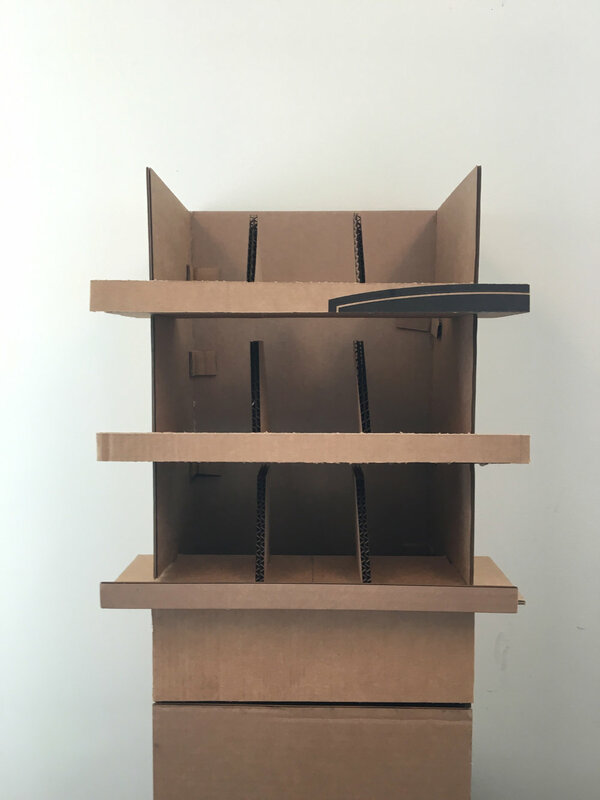 A kiosk emerged as the best solution to solve the user problems we uncovered. 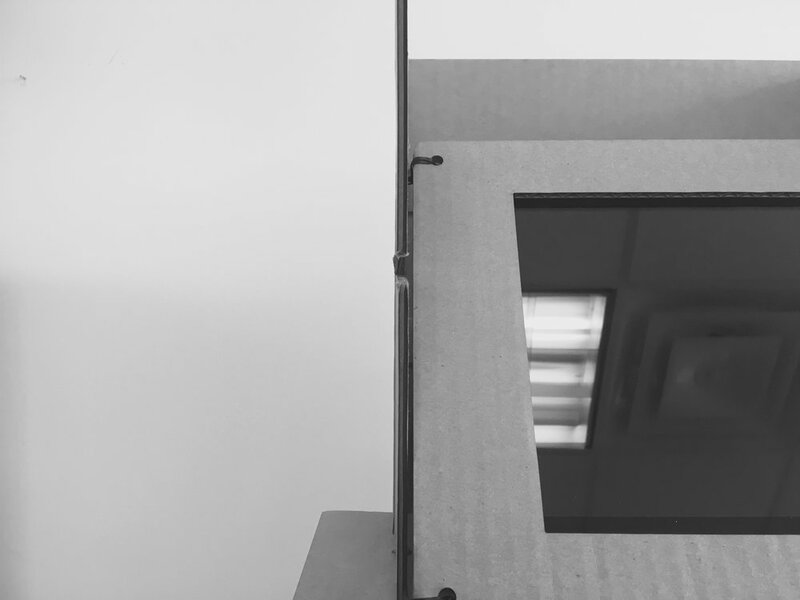 We immediately started building out our prototype - a physical kiosk (physical prototype) paired with a digital touch screen (software prototype). In conjunction with the prototype, we defined an evaluation plan. 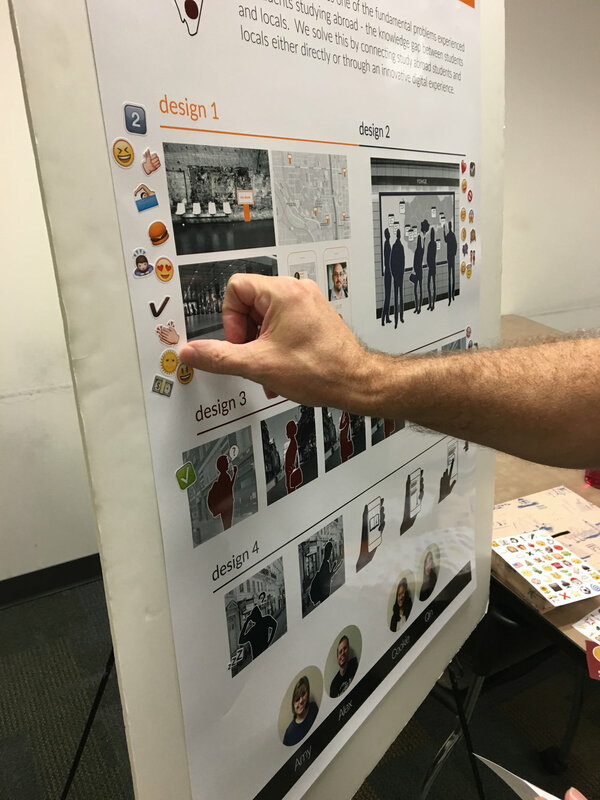 Finally, we conducted a formative usability study with 8 participants, summarized the results, proposed design changes, and presented our final project to the class (see poster). This project was completed with a team of four - Qin, Amy, Cookie. In each of the early stages, we equally split the work to give everyone some experience with each phase of the design process. However, the prototyping phase was pieced into the hardware part (tackled by Qin/Amy) and the software part (tackled exclusively by me) while Cookie contributed most to our report for this step of the project. The software prototype was a native iPad application built in Objective-C that allowed users to video call a "local", take notes during the call, interact with a map, and then email, text, or print their notes. The initial interaction requires the user swipe their student id. Since our physical prototype was purely made out of cardboard, I had to come up with a way to fake this interaction. I ended up building a companion iOS app with a bluetooth connection that I could discreetly use to advance to the next screen once the user swiped their card. My other primary contribution was designing all of the reports that we turned in for the project. Spouts - A children's companion for packing for road trips. For this project, we were constrained to use the Lego Mindstorms technology to build an operational counting device. We created a children's companion for packing for road trips. Growing up, I always grabbed way too much stuff to take on road trips. With Spouts, children are limited to packing a set number of items. The items fit inside Spouts and he animates when he's fully packed. Our original prototype was a Spouts version for packing DVDs to play in the car. Super-hearo - A mask designed to augment everyday vigilante's hearing. This project's prompt was to build a wearable prototype that allows a user to sense something they've never been able to sense before or to sense something in a different way than normal. We built Superhearo - a head-mounted wearable that augments the perception of quiet and distant sounds for a very distinctive user group, vigilantes. Inspired by superhero characters, the device has a dark, sleek aesthetic and a set of small microphones in the mask amplify soft sounds for the user, while haptic feedback is used to indicate the direction of the sound. Connected Teapot - A smart teapot that uses an unique visual indicator. Half-way through the semester we were tasked with creating a prototype that uses Internet of Things technology to create an assistive technology product. The final prototype had to meet the requirements of the CHI 2016 SDC "Design Problem". My partner and I created a connected teapot for the hearing impaired. Practically all teapots rely on auditory feedback, so we had to ask ourselves "how can we design a teapot that provides feedback that isn't auditory?" Our final solution was a connected teapot that alerts users via Philips Hue lights. Each of these projects was completed in sprints of 2-4 weeks with a technology or thematic prompt as a guideline. The common thread throughout the projects in this course was a focus on storytelling and how to effectively use prototypes to support a story. For this project, I originally came up with the idea based on my experience growing up and going on road trips. My partner (Monika Lee) and I both spent a fair amount of time iterating on the idea before we broke the work into two. I handled building the prototype while she produced the poster & image assets we needed for submission. Similar to Spouts, the main thrust of my work was technical. My partner (Kara Kenna) worked on the form, while I worked on the functional aspects. She produced a beautiful mask and then integrated the technical components that I collected, setup, and programmed. My partner presented our design and paper at the International Symposium on Wearable Computers. We co-wrote the paper. With this project, I focused on getting the Internet of Things side working while my partner (Emma Lee) focused on integrating my technology decisions with a purchased teapot. Ultimately, I created a solution with the Particle Photon, a temperature sensor, and Philips Hue connected lights. I also designed the poster we presented in class. During some spare time in the semester, I was able to explore using the laser cutter to create custom cutting boards.